Mexico's New Populist President Takes Office On Saturday While President-elect Andrés Manuel López Obrador's unorthodox approach has gained him a loyal following, his unpredictability is rattling international markets and stirring up critics. Mexican President-elect Andrés Manuel López Obrador waves to supporters during his national tour to thank those who voted for him in the July 1 elections, at the Plaza de las Tres Culturas in Mexico City, in late September. Mexico is about to swear in a president unlike any the country has seen in decades. Andrés Manuel López Obrador, a populist leftist, has pledged to clean Mexico of corruption, put the poor first, and shake up politics. While his unorthodox approach has gained him a loyal following, his unpredictability is rattling international markets, stirring up critics and setting him up for a standoff with the United States over migration. But outside the Mexico City house that has served as the incoming administration's transition offices, the crowds aren't worried about any of that. They've come to catch a glimpse of the 65-year-old, silver haired maverick. Some come to protest, including one small group chanting about the evils of bullfighting, while many come to ask for his intervention in personal disputes. Sandra Díaz, a mother of three, traveled three hours by bus from her rural town in nearby Puebla state. She has a community issue for the president-elect. "Our school doesn't have a wall around it and we need one for our young people to feel safe," she says. To say hopes are high for López Obrador is an understatement. And for the past five months, since he won more than 50 percent of the vote and his fledgling National Regeneration Movement, or MORENA party, captured both houses of Congress, López Obrador hasn't missed a chance to fuel those expectations with his populist rhetoric. "We are not just changing a government, we are talking about a regime change," he says at one of his frequent press conferences at the transition office. He stands beside huge posters of Mexico's historical figures. López Obrador insists that change can be achieved by "doing two basic things, combating corruption and maintaining an austere government," he says. He's already taken a pay cut and said no one in government can make more than him — 108,000 pesos, equal to just over $5,300 a month. He's been flying commercial airlines and is putting the presidential plane up for sale. And he insists that cutting out government graft will save enough money to pay for his promised college scholarships for the young and larger pensions for the elderly. But it's López Obrador's recent moves, especially with regard to economic policies, that have rattled markets and sent the peso tumbling. Last month, he held a nonbinding public referendum online about the future of Mexico City's $13 billion international airport, already under construction. Participants overwhelmingly voted to close down the project, just as López Obrador himself had signaled he would. 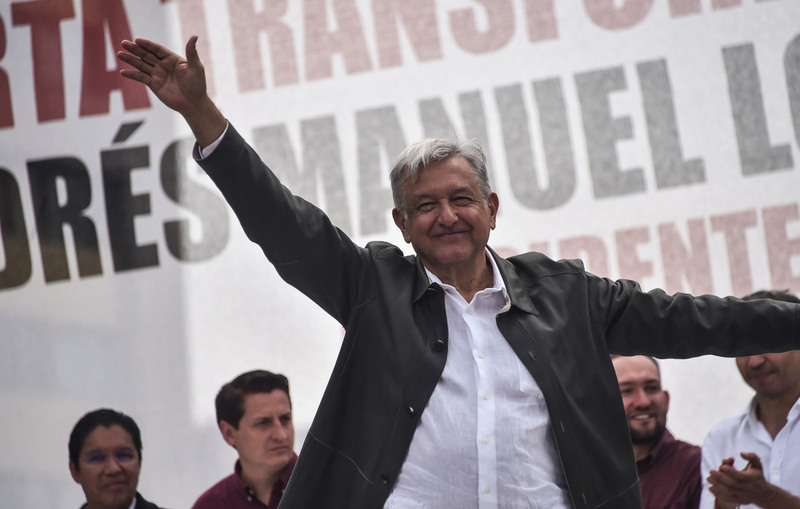 Daniel Kerner, an analyst with the global risk consultancy Eurasia Group, says investors had initially rallied behind López Obrador, hopeful that his more pragmatic campaign rhetoric would prevail. But Kerner says markets are skeptical especially since López Obrador has been endorsing more state control over the economy. "Mexico for the past three decades has been probably in the lowest possible category of political risk compared to other emerging markets, because it was a very stable country and that is going to change," he predicts with the new administration. Mexico's Central Bank just lowered economic growth projections for next year. Some of López Obrador's recent flurry of proposals and shifting statements have taken a toll on citizens' confidence in him, says Denise Dresser, a Mexican professor and political commentator. That includes his reversal of a pledge not to use the military, which is tainted with accusations of abuse, to fight drug cartels and violent crime. But in terms of his dealings with the U.S., Dresser adds, López Obrador so far seems determined not to ruffle any feathers. "López Obrador has decided to take a pragmatic position vis-à-vis Donald Trump. He is not going to confront him, he is not going to fight him," she says. He doesn't want a confrontation with Trump in the beginning of his administration, Dresser adds. Whether or not that happens will be put to the test quickly as the two countries deal with the thousands of U.S.-bound migrants now amassed in northern Mexico. López Obrador's administration has signaled it may be willing to have the migrants remain in Mexico while they go through the U.S.'s lengthy asylum application process. Who knows, the two unconventional presidents may just get along. Trump has recently heaped praise on López Obrador. And while the U.S. leader won't be attending Saturday's inauguration in Mexico City, he is sending his own daughter Ivanka Trump as well as Vice President Pence.